The rain clouds gather all of a sudden, wrapping the sun in their fold. The sky turns grey but the oceans below me are a distinct blue. Two adventurous men in their rafts are heading towards the shore as the rains tumble down. I am standing atop the city walls of the Old Town in Dubrovnik, a coastal city on the Mediterranean Sea in Croatia. Lost in the medieval world, I am looking down at the oceans from a height of 82 feet as the walls encircle the Old Town The ancient city walls, which encircle the Old Town are one of the Dubrovnik tourist attractions. There are about 6300 feet or about 2 km long and the views keep changing as I walk along the narrow edges. The turquoise waters of the Adriatic Sea merge with the orange and red facade of the houses and buildings of the Old Town. Giant forts loom large in front of me. The fortifications of the Dubrovnik Old Town, one of the places to see in Dubrovnik date back to the 9th century and the current city walls, the pride of Dubrovnik has apparently never ever been breached. With over 5 bastions and 17 towers and a moat filled with 120 canons, the formidable town had always intimidated its enemies. But as I stand here and lose myself in the forts and castles of the Old Town, I feel myself drawn into another fantasy land. My eyes slowly start playing tricks on me. I am transported into another medieval land of fantasy and drama filled with knights, dragons and zombies. And then I realize why it is so similar. As my guide, Ivana says, with a laugh,” Welcome to Dubrovnik. 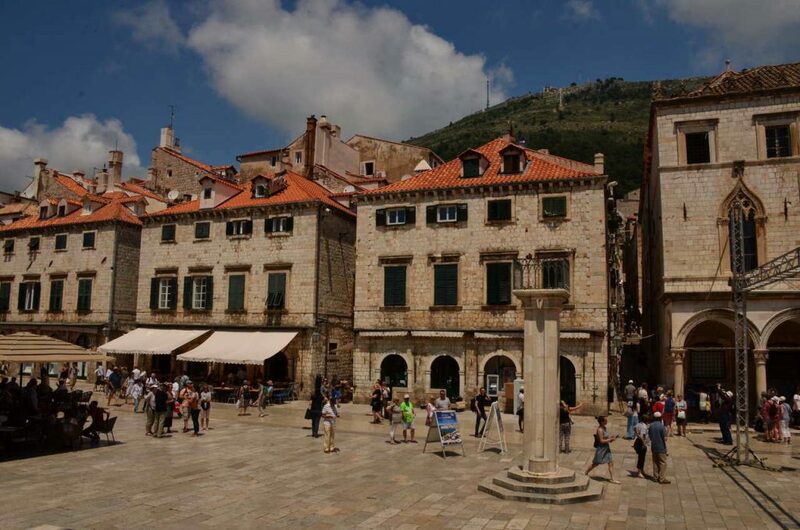 You are now looking at the streets and panorama of King’s Landing.” For a moment, we are no longer in the charming seaside town Dubrovnik or in Croatia as we enter the capital of Westeros- King’s Landing. 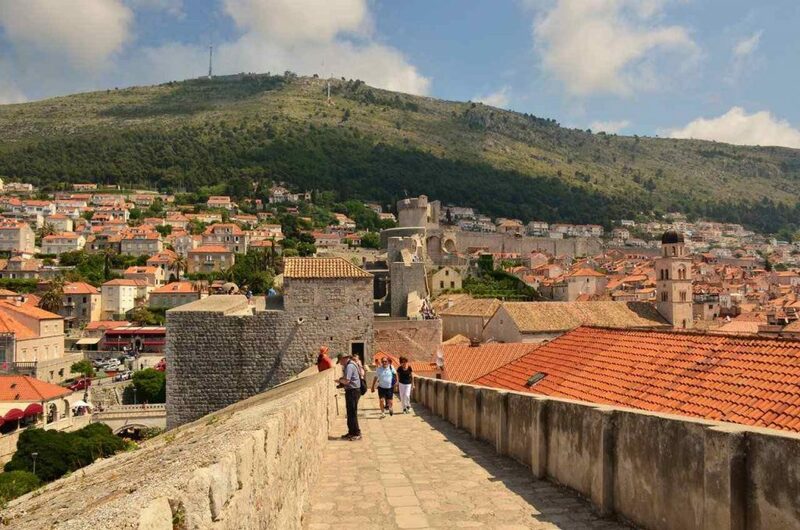 The Game of Thrones walking tour of Dubrovnik takes us into a wonderland of lore and gore. But the Old Town of Dubrovnik does not fade away from the mind’s eye. As I walk around, I realize that I am wandering through the realms of two medieval lands, one which is rich in history and the other, which is mired with fantasy. Dubrovnik is also one of the few cities in the Adriatic coastline which boasts of a formidable and uninterrupted city wall that is iconic. 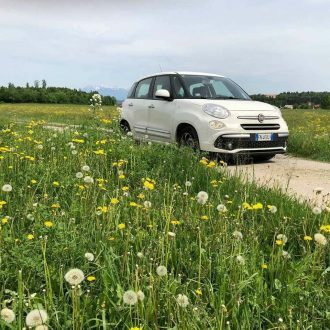 Glittering in white, even on a cloudy day, the walls probably gave the city its title – the Pearl of the Adriatic. 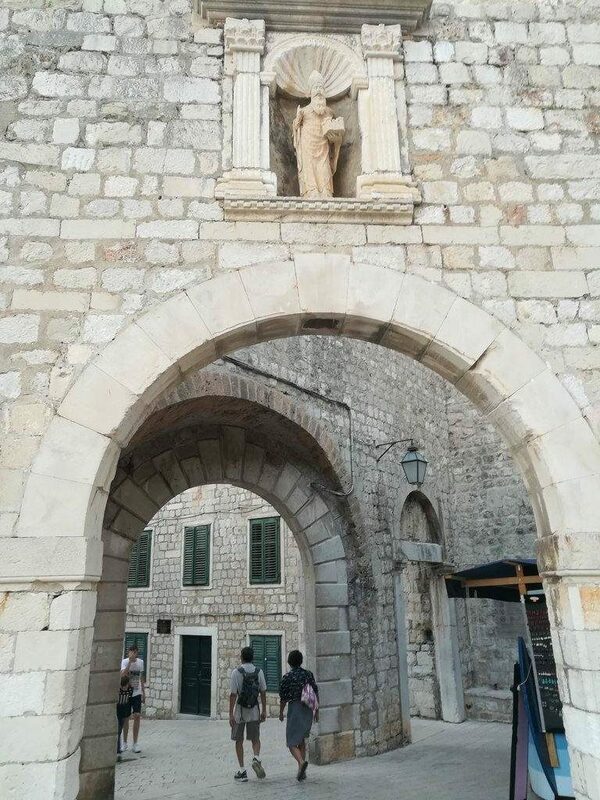 While the Old Town is known for its magnificent citadels and towers, cathedrals and monasteries, palaces and granaries, the city walls are one of the unique plaes to see in Dubrovnik. Tourists make a beeline to climb it and there are at least three entrances to the medieval walls. To me, it is one of the most special experiences in an Old Town. It almost feels like I have stepped back into a time machine. The walls date back to the 9th century when Dubrovnik, then a small settlement on the island of Laus was known to be a strong bastion. A Roman Greek city, it slowly became a Croatian town and the entire Old Town was encircled with these thick walls, which was built of stone and lime. There was a time where 15 forts were built to strengthen it. 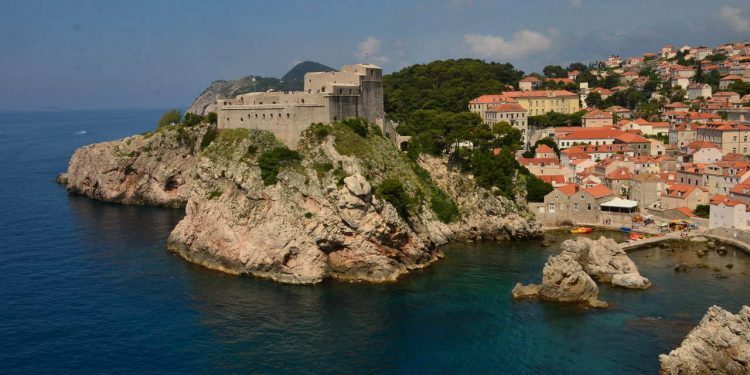 Some of the forts that remain even today are Bokar Fortress, Minceta Tower, Fortress of Saint John, Lovrijenac Fortress and the Fortress Revelin, which are some of Dubrovnik tourist attractions and they stand at the cardinal directions defending the city. 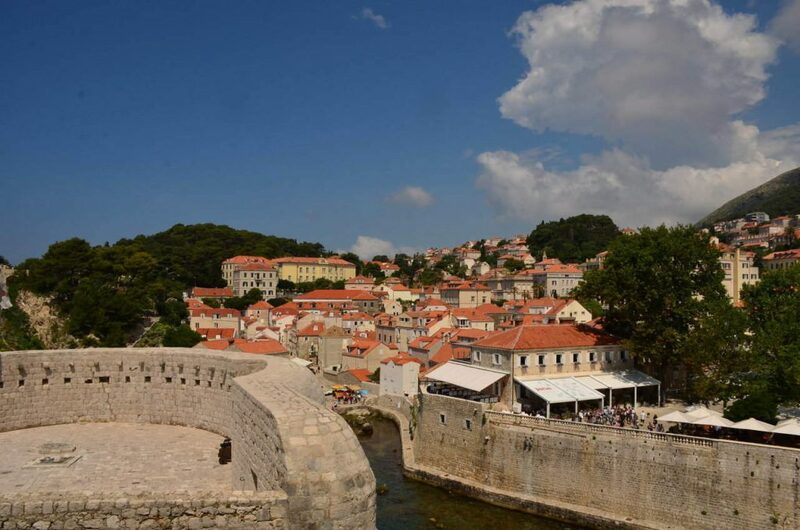 There are four gates to the Old Town, two of them lead to the old harbour, while the other two with drawbridges are the main entrances on land. The Pile Gate, which is one of the main entrances is a fortified complex by itself. Standing there the dark clouds create a dramatic aura. Boats bob around in the jetty as tourists wade through the gate. The stone bridge with two Gothic arches leads to a wooden drawbridge leads to the Old Town. It is crowded as tourists wade in and out. Towering above us are the looming fortresses – Lovrijenac and Bokor Fortresses , tourist attractions of Dubrovnik. The first fort that I see when I enter the city is the 600-year-old Bokar Fortress, which stands right next to Pile Gate and was built only to defend it. It was built as a two-storeyed semi-circular tower with stone corollas and a part of it stands on a detached piece of rock on the sea. 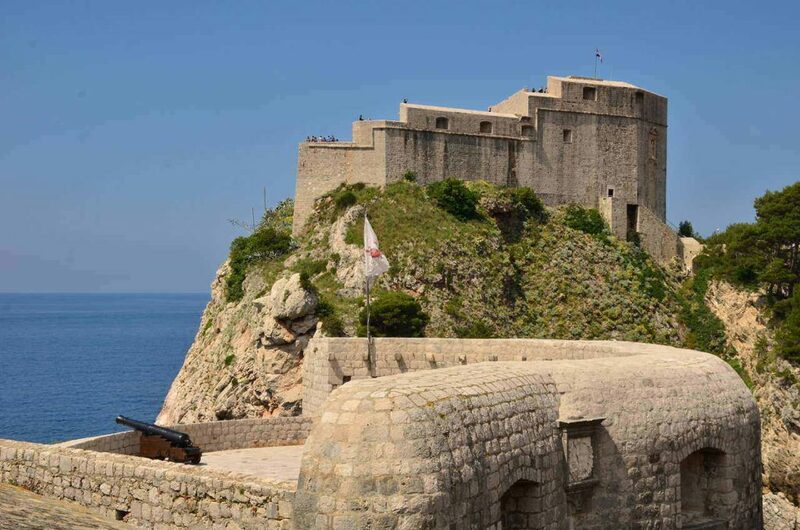 If Bokar was the very symbol of a formidable fort, then the Gibralter of Dubrovnik – the Lovrijenac Fortress standing tall on a 37-metre sheer rock is absolutely intimidating. 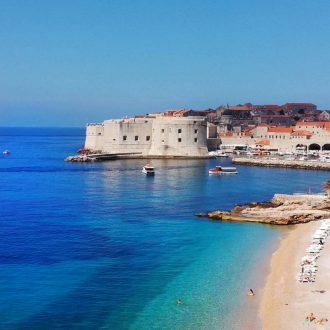 The Venetians, who were the arch rivals of the coastal city threatened to invade Dubrovnik and had laid claim to the cliff, planning to build a fortress. However, the council got wind of their plans. Overnight they created a castle. But they built initially just a 12-metre thick wall of the fortress, which gave the impression of a huge citadel. When the Venetians landed they were alarmed and apparently they retreated at the mere sight of it. Facing the sea and the Bokar Fortress, the fort was further strengthened with 20 canons and the largest of them was nicknamed “The Lizard.” Today it is believed to be lost somewhere below the sea when the rope holding the canon gave way and it vanished into the depths. An inscription stands here which says “Freedom is not sold for all the gold in the world,” a reference to a story from Aesop’s Fable, but a reminder that Dubrovnik was never breached and it valued above everything, its freedom. 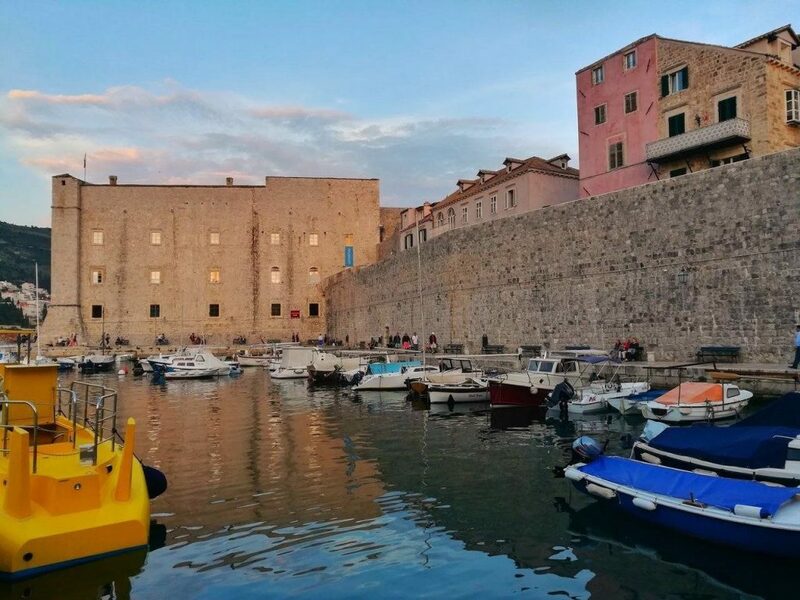 I look out into the moat that surrounds the Old Town and the charming fishing harbour lies beyond it. This is the most picturesque view of the main portal to the city. This is where the cruises land from far away lands and you can explore Dubrovnik Old Town and lose yourself in the many stories. 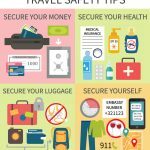 Celebrity Cruises is one of the premium and modern cruises that takes you on a luxury vacation around the world. 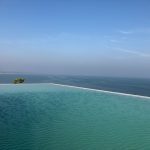 And you can check out some of the Celebrity’s European cruises and the itineraries that bring you to the Adriatic shore. 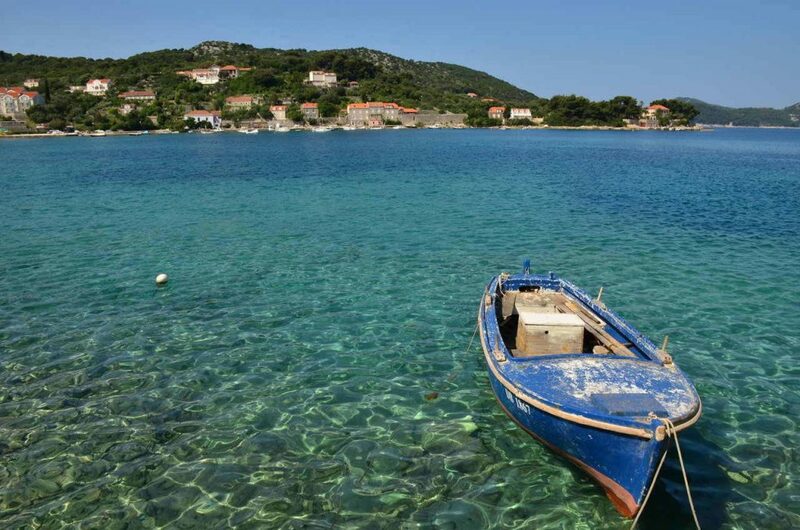 You can choose from over 30 options for a Mediterranean cruises besides voyages across Northern Europe and Translatlantic and most of them include Dubrovnik. With fine dining options, bars and restaurants, live shows and musicals, on board entertainment, duty free shopping, spas to personalised pool buttlers, the cruise is an experience by itelf. 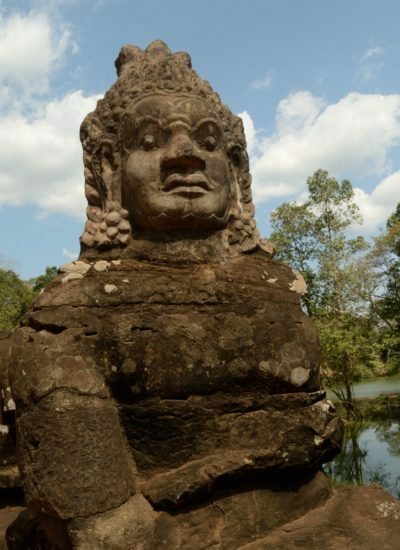 However, my attention is drawn back to the Pile Gate where stone statues tell a story. Before stepping on to the wooden drawbridge, I look up to see a massive statue of St Blaise, who is the patron saint of Dubrovnik. 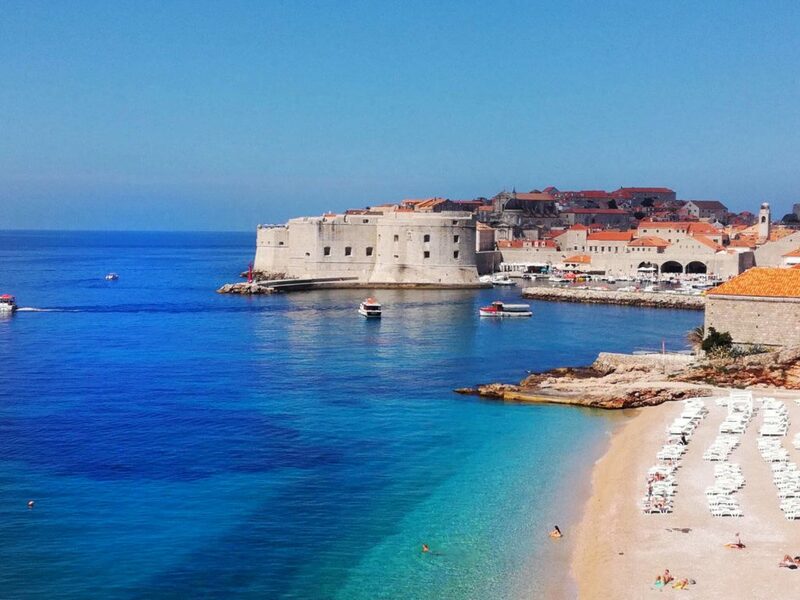 According to a legend, he warned the people of Dubrovnik about a surprise attack planned by Venetians on their city. 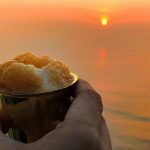 The story goes that the Venetians had anchored their ships close to the Old Port and were pretending to take a break before proceeding on the harbour. St Blaise apparently alerted one of the local priests of their plans and the council immediately shut the gates and thwarted the attempts of the Venetians who immediately set sail and retreated. Ever since then St Blaise became the patron saint of Dubrovnik and is always there on the walls, watching out into the ocean and keeping an eye for formidable foes. 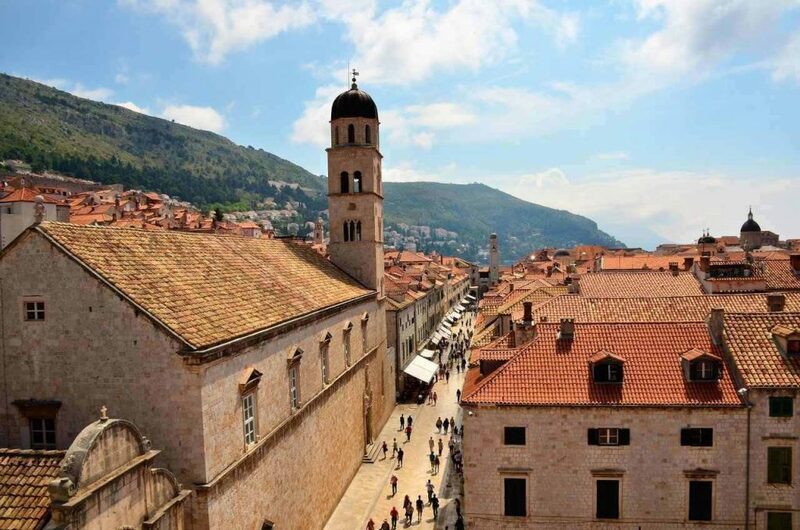 There is a beautiful church dedicated to him in the Old Town, which is also sought after as a wedding destination and is one of the tourist attractions of Dubrovnik. But not every story is about a saint. Looking up I see three heads – one of a bearded man with two sculptures of women, possibly sisters. Apparently, the story is about forbidden love, a possible scandal and or an immoral alliance between a Franciscan friar and the nuns of St Klarisa. Apparently, the legend refers to a Republic friar who was having an affair with the nuns in the monastery and he was executed. 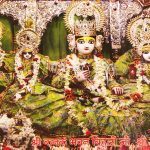 Yet, some say that the allegation against him was false as he was not in the good books of the government. Everyone adds his interpretation to the story, yet the stones are silent and the heads do not speak. One would probably never know the true story. The Franciscan Monastery is one of the most important attractions of the Old Town but it is the pharmacy inside that beckons me. Both the monastery and the pharmacy were built in 1317. As I enter I realize that I am inside the third oldest functioning pharmacies in the world. The medicines here were for the monks but they were sold to the public as well and ensured that the religious order had a regular income. The church was constructed in the Baroque style of architecture and pottering around, I stumble upon one of the most beautiful cloisters built in the medieval eras. It literally transports you into a different world. The monastery also houses one of the oldest libraries with over 70000 books and several other paintings and artefacts and precious relics. 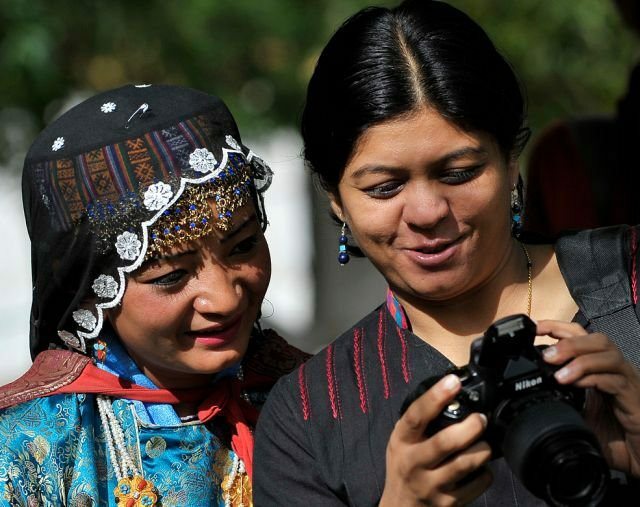 The walled city has indeed its share of stories and most of them are quirky and are overshadowed by the fantasy show that is shot here. In front of the St Blaise Church, there is a column that is dedicated to a handsome knight called Orlando, who was apparently the nephew of Charlemagne, the Emperor. Near the column is a small platform where the citizens gathered to hear announcements or to witness punishments. However, I am more curious about Orlando, who according to some legends was one of the soldiers who had fought valiantly in a battle and had saved thousands of lives. And yet, Ivana said that it might not be true. The only interesting thing about Orlando according to her is his forearm. It was used as the standard of for the traditional measure for trading fabric referred to as a Ragusan cubit or lakat which means elbow. But Orlando stands here, more as a symbol of a valiant knight of Dubrovnik. Besides Placa Street, there is the Big or Siroka Street which is almost thrice the size of a normal street. The most interesting monument here is the Rupe Granary, which was built in the 16th century. A three-storeyed structure, this now houses the Ethnographic Museum. In Game of Thrones, however, it was a brothel. There are several churches and monasteries in the Old Town, but it is the cathedral that fascinates me. And it comes with a story too. 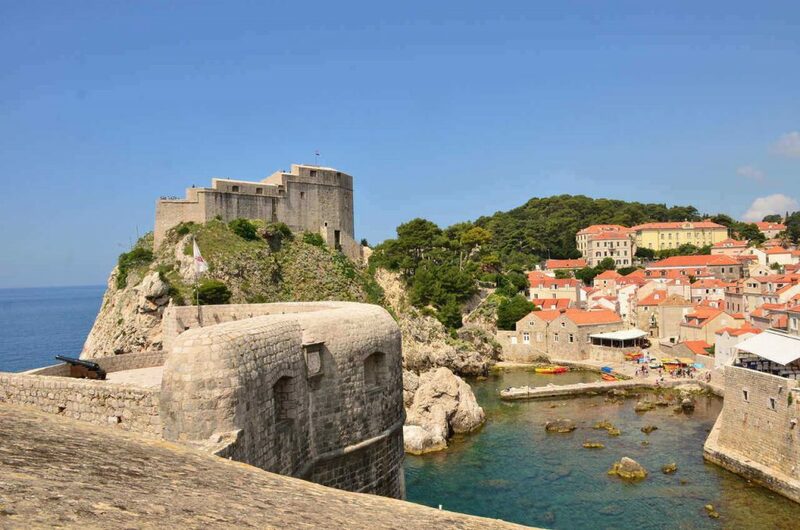 In the 12th century, one of the powerful emperors, Richard the Lionheart was returning from a war by ship when he was shipwrecked near Lokrum, an island located in the Adriatic Ocean, right in front of Dubrovnik Old Town. He was saved by the local fishermen and was given hospitality by the Dubrovnik Council, who even gave him a ship to return. 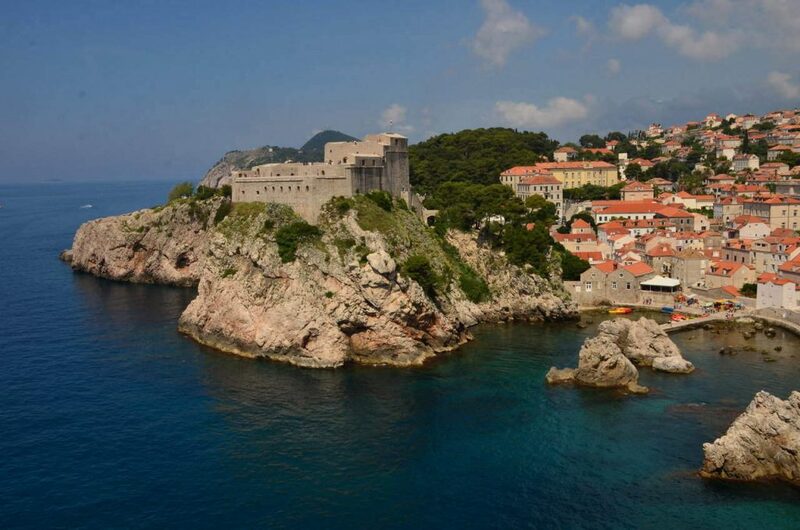 In those days, the ships of Dubrovnik were legends by themselves and the town was known for its shipbuilding. He wanted to thank god and the people and offered to build a cathedral in Lokrum. The council of Dubrovnik, however, requested him to build the cathedral in their city. Built in Romanesque style, the medieval cathedral was however destroyed by an earthquake and was rebuilt later on. Apparently, when the restoration was done a few years ago, archaeologists discovered remains of an older cathedral which was probably even older than that built by King Richard. Besides the Franciscan monastery, there is the Dominican monastery at the other end of the Old Town and it seems to be almost enclosed within the City Walls. The construction of the monastery and the church took almost two centuries to complete. 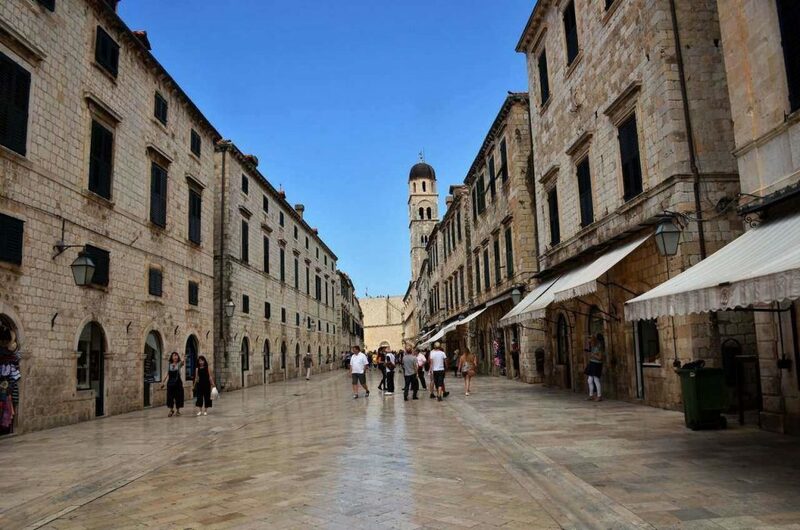 The entire street leading to the monastery was called the Dominican Street and in Game of Thrones, it was the market where even Ivana gets her 15 seconds of fame as a peasant. She then takes me next to the Jesuit College and the St Ignatius Church where a monumental staircase built in Baroque style grabs my attention. 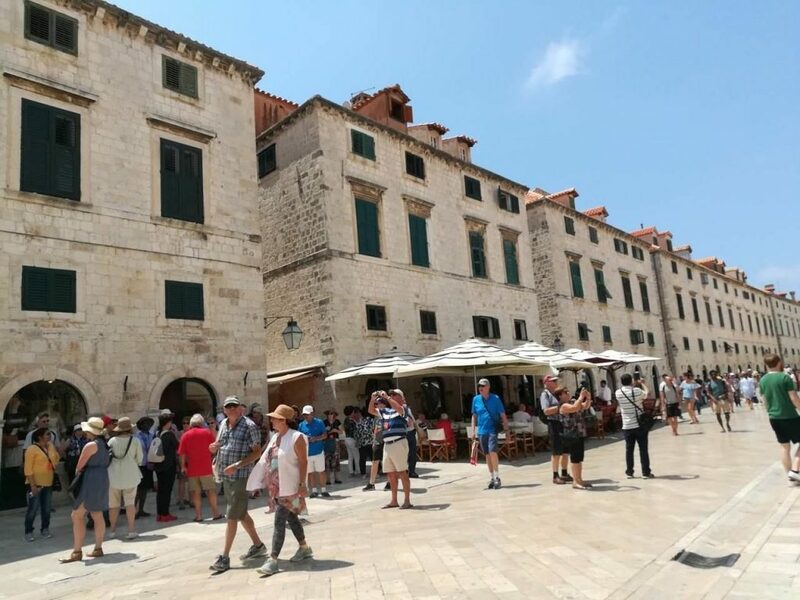 This is the most important location for Game of Throne lovers, where an iconic, controversial, dramatic and poignant scene was shot – The Walk of Shame! I finally head to the old harbour which was protected by these old forts. 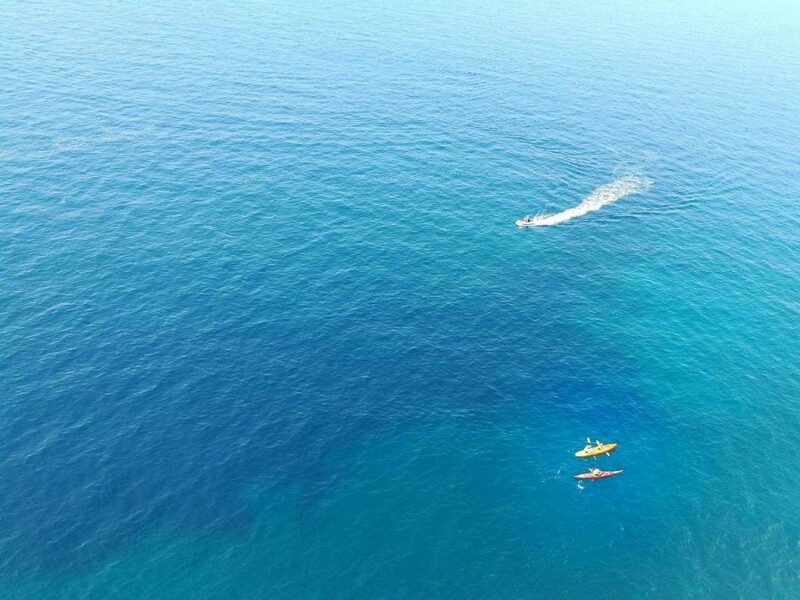 Today it is buzzing with tourists who cruise down the ocean to the neighbouring Lokrum Island, which is one of the places to see in Dubrovnik. I board one of them and within 20 minutes, I am in another fantasy land. Ruins of an old monastery stand while a small cathedral and beautiful gardens greet me. And yet a little treasure lies hidden in this island. Pottering around, I stumble upon it, in a little room. The Iron Throne stands there, hidden away from the view of the tourists. 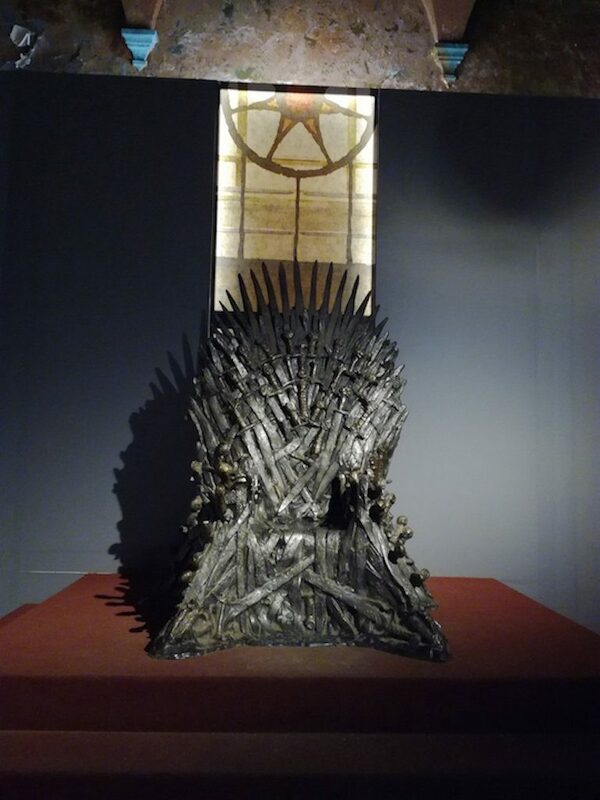 The Game of Thrones may eventually end with who sits on this throne, but for me, the fantasy has just turned real.